Today is overcast in Toronto, and if you are anything like me dreary weather makes you feel pretty blah. My solution? 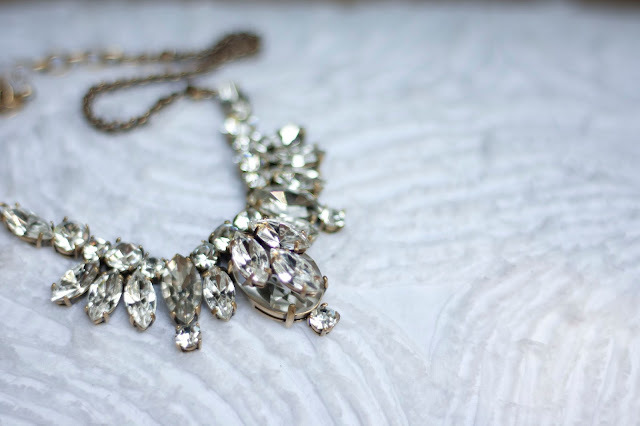 Add something sparkly to your look! Like wearing pretty underwear, adding a great piece of jewelry to your outfit really makes you feel better. The piece above is from J.Crew and makes even the simplest of outfits special. If you aren't a statement necklace kind of girl, try a ring or bracelet, which will give you just the tiniest hint of sparkle without being overwhelming. Plus you don't need a mirror to admire it!